In his 2004 memoir, Chronicles: Volume One, Dylan would write about how he “failed to sense the ominous forebodings in the introduction.” One year later, he would learn just how possessive the Newport audiences felt toward him. 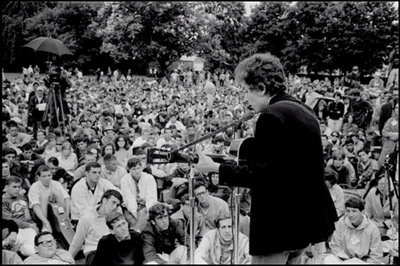 On this day in 1965, Bob Dylan went electric at the Newport Folk Festival, performing a rock-and-roll set publicly for the very first time while a chorus of shouts and boos rained down on him from a dismayed audience. Six weeks earlier, Bob Dylan had recorded the single that marked his move out of acoustic folk and into the idiom of electrified rock and roll. “Like A Rolling Stone” had only been released five days before his appearance at Newport, however, so most in the audience had no idea what lay in store for them. Neither did festival organizers, who were as surprised to see Dylan’s crew setting up heavy sound equipment during sound check as that evening’s audience would be to hear what came out of it. With guitarist Al Kooper and The Paul Butterfield Blues Band backing him, Dylan took to the stage with his Fender Stratocaster on the evening of July 25 and launched into an electrified version of “Maggie’s Farm.” Almost immediately, the jeering and yelling from the audience grew loud enough nearly to drown out the sound of Dylan and his band. It has been stated by some who witnessed the historic performance that some of the yelling from the audience that night was about the terrible sound quality of the performance—overloud in general and mixed so poorly that Dylan’s vocals were unintelligible. But what prompted the outright booing—even over Dylan’s next number, the now-classic “Like A Rolling Stone”—was a sense of dismay and betrayal on the part of an audience unprepared for the singer’s new artistic direction.